There is perhaps no sport that is associated with America more so than baseball. From the early days of Ty Cobb and Babe Ruth to today’s young superstars like Mike Trout and Andrew McCutchen, baseball is a game that provides memories that last a lifetime. For any young fan who becomes interested in the game, trading cards are a natural progression in their love of the game. Sitting around with a group of friends, comparing and trading cards while also fantasizing about what it would be like to be the manager of a team with every All-Star you could imagine made the time fly by. In today’s world fantasy can become a reality with baseball strategy games like Stratomatic Baseball and MLB Showdown. MLB Showdown is a game which allows you to manage your own MLB team. In MLB Showdown, an MLB team is a carefully selected group of batters and pitchers. The advanced search on showdowncards.com can greatly help you in selecting just the cards with the ability to search and sort by all the card statistics. The card statistics represent a player’s previous season performance. 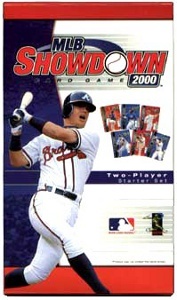 MLB Showdown is a timeless classic with the strategy and game mechanics holding true to the art and finesse of managing a real major league baseball team. This baseball strategy game is a great game people enjoy playing today even though new cards have not been released in many years. There are still plenty of MLB Showdown starters to get new players involved. 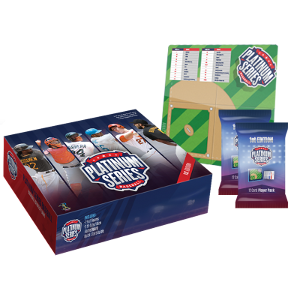 Now there is an exciting new game called Platinum Series Baseball and you can buy the Platinum Series Baseball Game Starter Game Box. Since every grown-up MLB Showdown fan still has that enthusiastic kid inside them, it’s only natural to want to test your skills as a big-league manager. 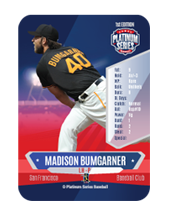 Whether it’s trying to decide where Mike Trout should hit in the batting order or if Madison Bumgarner should stay in to pitch another inning, Platinum Series Baseball will let you see once and for all just how good a manager you really are. Platinum Series Baseball is like two games in one with a quick and easy set of instructions for kids or beginners and advanced rules for adults or experienced players. 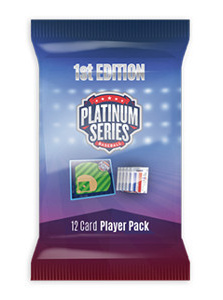 What is Platinum Series Baseball Game? The only baseball strategy board game that is currently licensed by the Major League Baseball Players Association, Platinum Series Baseball is a baseball dice game that lets you build the ultimate team of All-Stars you’ve always wanted. A fast-paced tabletop board game that uses dice and baseball cards with player stats to put your managerial skills to the test, it puts you in complete control of your very own MLB All-Star franchise. Considered to be one of the most realistic head-to-head baseball simulations, the game lets the roll of the dice determine the outcome of each play. Just like in a real game, each manager needs to consider all possible strategies and make the best use of his roster in order to come out on top. As you become more familiar with the game and hone your skills as the best big-league manager, you can access even more gameplay features that will help your team come out on top. Stats such as game-day weather forecasts, stadium nuances and more can all add up to help you and your team wind up as the day’s big winners. If you like a combination of suspense and competitiveness, you’ll love Platinum Series Baseball. Just like in a real big-league game, fortunes can change in an instant. What looks like a certain base hit can be taken away in the blink of an eye by a great second baseman, while a fly ball that looks catchable just keeps going and going until it’s a home run. So similar to the real game that you’ll feel like you’re sitting in the dugout, Platinum Series Baseball offers unmatched excitement. 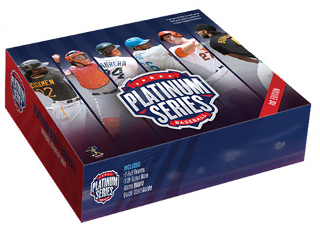 What’s In The Platinum Series Baseball Game Box? The Platinum Series Baseball game has everything you need to get started playing right away with friends and family. Included with the game are 30 player cards that allow you to field a complete team, three 10-sided dice that let you hold your team’s fortune in your hands, the game board itself, score card, player card stands and easy-to-understand instructions. As you play the game and gain experience, you can take advantage of the game’s advanced features that can be accessed online through the advanced rules. The advanced rules incorporate all the PSB card statistics and many of the card attributes can be found using the ShowdownCards.com Platinum Series Baseball cards advanced search where you can find batters and pitcher cards matching the criteria you select. The PSB cards advanced search allows you to find players based on offensive and defensive attributes. Some of the more important Platinum Series Baseball game search criteria include offensive ratings Hits, On Base, Bases and defensive metrics Error, Range, Throwing Arm, Passed Ball and Pickoff. To add even more excitement and allow for more strategies to be used during the game, players have the option of purchasing additional Player Packs to give them more players from which to choose. These packs contain 12 cards and are filled with eight fielding position players and four pitchers. So whether your team needs a new relief pitcher or a first baseman, Player Packs allow you to create an All-Star team that may just be unbeatable with you at the helm. After you’ve played a few games and know you’ve got what it takes to win it all, you can decide to go all in and purchase a Wax Box complete with 24 Player Packs. It’s a bargain for any manager looking to add top-notch talent to his roster. With 12 cards per pack, you suddenly have 288 big-league stars from which to choose, and you’ll have your pick of the best players in the majors. Although you will likely need to buy and sort through several wax boxes to get a copy of each of the 600+ cards that come in the 1st edition set. If you know you are ready to manage the best talent MLB has to offer, you’ll need to collect all the cards and there are more than 600 real Major League players that make up the complete set. These cards can give you hours of fun mixing and matching in order to form the perfect winning team. 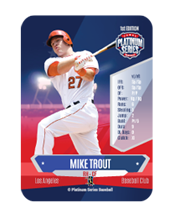 Take your Platinum Series Baseball experience to a whole new level with a huge number of hitter and pitchers to choose form. As with any game, it’s important to have a good understanding of the rules. One of the biggest advantages of Platinum Series Baseball is its ability to be enjoyed by both younger, inexperienced players as well as older players with more in-depth knowledge of the game. For players just starting out, the Quick Play rules offer the best way to get started, since they provide an excellent overview of how the game is played, turn taking and other key aspects of the game. Prior to the game beginning, both managers meet and decide who will be the home team and who will be the visiting team. This is determined by each manager rolling one die, with the highest roll being the home team. Once this is determined, each manager chooses and announces his starting pitcher for the game. Once this is done, it’s time to select the starting lineup from their cards. Each team will have between 9-25 players on its roster, depending upon the manager’s preferences. After the players are selected, each manager then creates their batting order and records it on the score sheet. After the batting order is finalized, each manager can then designate their relief pitchers and even a designated hitter. As in a big-league game, when the DH is in the lineup, pitchers do not bat. Once the lineup is in place and both teams are ready, it’s time to play ball. The game will be played for nine innings or even more if needed, until there is a winner. So be aware, if you find yourself in a tightly-contested game of wits you may wind up in an 18 or 20-inning marathon. The visiting team will bat first, with card holders used to mark who is batting, any players on base, the pitcher and the batter in the on-deck circle. If a manager uses a switch-hitter, he must state which side of the plate his player is batting from prior to the first pitch. To determine the outcome of the at-bat, the batter will role the three dice. The roll will be read as a three-digit number in the order of red, white and blue. Each die is numbered 0-9, and how each die falls can greatly influence the game. For rolls that result in a number less than 500, the batter’s player card is consulted for the outcome. Depending upon the pitcher, the “vs. LH” or “vs. RH” columns are used. If the roll is more than 500, the pitcher’s card is consulted, with the same columns on their cards being used to determine the results of the at-bat. If it happens in a real big-league game, it can happen here. Singles, triples, double-plays and the always-popular towering home run can occur, keeping the game’s outcome in constant doubt. Once three outs are reached, managers switch from offense to defense and play the bottom half of the inning. After gaining experience from a few games, managers can use the Advanced gameplay instructions to add such aspects as stolen bases, double plays, wild pitches and more to make the game even more realistic. The best way to gain an understanding of how PSB is played is by reading through the instructions. The PSB instructions are also known as the Quick Play rules and these are available online for viewing and download. These are included in the PSB Game box but if you are still waiting for your game or deciding to buy then reading through the rules will help. The Advanced Rules are discussed later in this article. As you read through the instructions and while you play the game you will also make use of the PSB Game Charts Booklet. Score sheets are used to setup a game and track a games progress. The game includes a pack of score sheets but you will likely go through them fast and need more, luckily these are also available for download. The best way to put both a player’s and manager’s true skills to the test, the Advanced Rules make any Platinum Series Baseball game feel like game seven of the World Series. One of the best aspects of Platinum Series Baseball is its ability to be played as a solitaire game or with groups of three or more. However, most games are played between two individuals, although the instructions can be easily adapted for more players who want to participate. In most cases, it takes about 20 minutes for the initial set-up that involves managers picking players and creating batting orders. Most games can be completed in about two hours, unless of course extra innings are needed to decide the winner. In these games where one hit or pitch can determine the winner, the team that prevails always has a little luck on its side as well as one player coming through in crunch time. Prior to the start of the game, both managers agree on the game’s location. It can take place in the home or visiting team’s ballpark, so you may find yourself playing at Golden Gate Park in San Francisco or at revered Yankee Stadium. Games can also be played at neutral sites, lending yet another area of strategy that must be utilized during the game. But even if the game is at a neutral park, managers still must decide who will be designated as the home team and visiting team to determine who bats first. Advanced Rules also take into consideration if the game is a day game or night game, along with the time of year the game is played. For example, a day game played in summer will be done so in hotter weather, which often leads to longer game times than those played in cooler autumn weather. Just like in Major League games, some Platinum Series Baseball pitchers are stronger than others and can pitch more innings. To help managers decide how to best use their pitchers, each Player Card for pitchers comes with a Fatigue Rating. Starting pitchers will have a numerical value assigned to them, while relief pitchers will be rated as short, middle or long. In some unique circumstances, managers can choose to use long relief pitchers as their starting pitchers, especially if they are planning to use a bullpen by committee. For games where weather will play a factor, two dice can be rolled to determine the outside temperature. The Weather Effects Chart, which shows the weather region in which each stadium is located, is then utilized to determine the game-time temperature. Power: Power ratings show if a player is able to hit fly balls that often turn into home runs. Jump: Jump shows a player’s ability to get a step ahead of the defense when attempting to steal a base. Clutch: Clutch, arguably the most important Player Rating, shows how well a player has performed under pressure when the game is on the line. The Clutch rating is determined by how many times the batter has responded when they represented the tying or go-ahead run from the 7th-inning on, which makes the difference in many games during a long baseball season. Pickoff: The Pickoff rating shows how well a pitcher can pick off base runners. As any baseball fan knows, it’s the ultimate strategy game. Stealing a base, executing a suicide squeeze to perfection or pulling off a double play to end a rally all make baseball a game where fans and players both never know what will happen next. As many teams over the years have found out, a game is not over until that last out is recorded. Just like the games on the field, Platinum Series Baseball is just as intense and every bit as complex. Baseball is often compared to a game of chess, with each manager making not only the move fans see at the moment, but also thinking several moves ahead at the same time. This aspect of the sport is what makes Platinum Series Baseball so interesting to so many fans, because it lets them see, hear and feel what the manager of their favorite team goes through during the course of a game. Should I leave my starting pitcher in for another batter, or make the call to the bullpen? Will my cleanup hitter break out of his slump and come through in the clutch? Should I risk it all and try to steal home or call for a suicide squeeze? With the game on the line, you can feel just like a manager sitting in the dugout, sweating it out until the final out is recorded. If you’re a baseball fan, Platinum Series Baseball is for you. Complex in many ways, it’s still simple enough for fans of any age or skill level to enjoy. Imagine having the likes of Trout, Cabrera, Molina, Puig, Kershaw, Bumgarner and other All-Stars at your disposal. With a lineup like that, it’s hard for almost any manager to lose. But like they say, on any given day anything can happen, so that’s why they play the game. Whether you play Platinum Series Baseball in solitaire form as the manager of both teams or with one or more competitors, you’re guaranteed to find yourself itching to play a doubleheader once the first game is completed. � Copyright 2000-2017 ShowdownCards.com. All Rights Reserved. This site is not associated, endorsed by or affiliated with Platinum Series Baseball, Wizards of the Coast, Major League Baseball, MLB Players Association, National Basketball Association, National Football League or NFL Players Inc.. Showdown Sports Card Games are trademark of Wizards of the Coast.